The Supreme Court (SC) today went into 13-day vacation, leaving Chamber Judge Court and seven High Court vacation benches to deal with the emergency matters. The SC will come into regular action on March 31. “Justice Hasan Foez Siddique will hold hearing of cases at the apex court as Appellate Division Chamber Judge on March 19 and 25,” a notice signed by SC Registrar Md. Badrul Alam Bhuiyan said. 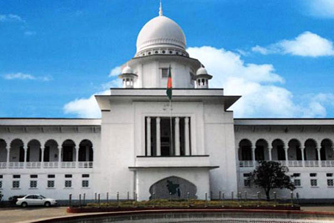 Another notice signed by High Court division deputy registrar ((Administration and Judicial) Mohammad Aktaruzzaman Bhuiyan said four two-judge benches and three single judge benches will deal with emergency matters during the vacation. “Justice Hasan Foez Siddique will hold hearing of cases at the apex court as Appellate Division Chamber Judge on March 19 and 25,” a notice signed by SC Registrar Md.